Having previewed the battle for the overall classification here, we now look at the fight for some of the other jerseys in the 2013 Tour de France. The race for the green jersey should be a particularly enthralling one between the past two winners of this jersey – Mark Cavendish and Peter Sagan. After back-to-back second places, Mark Cavendish finally won the green jersey in 2011, but was unable to defend it last year. This was predominantly due to his ill-fated move to Team Sky. With his team concentrating on winning the overall classification for Bradley Wiggins, it meant that he was there as a domestique, rather than with a team behind him to win the green jersey. 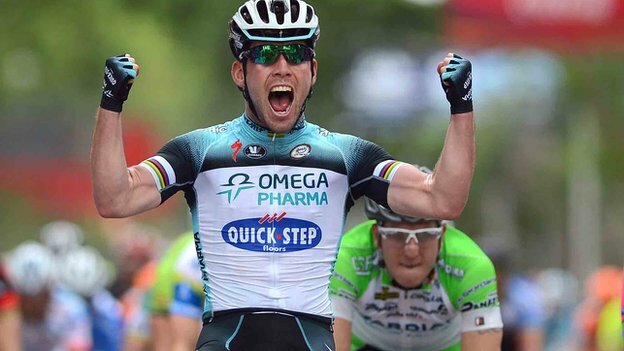 This year, Omega Pharma Quick-Step has no such split focus. Mark Cavendish is the sole priority for them and he should be back to challenging seriously for the jersey. With Tony Martin, Matteo Trentin and Gert Steegmans, he should have a train capable of delivering him to the perfect position. Peter Sagan has been one of the revelations of the past two years. Last year, he won three stages, but his ability to pick up points in virtually any stage was critical. He has shown his ability to climb well, enabling him to pick up stage wins in reduced bunch sprints as well as collecting intermediate points in the mountain stages. This year, he also has a team dedicated solely to supporting him unlike last year, where he was arguably riding in support of Vincenzo Nibali. So, we need to look at the route to really determine who is likely to win the jersey. In terms of virtually flat stages, there would appear to be six. These are the stages where a large bunch sprint should occur, and where Mark Cavendish will be a strong favourite. The key for Sagan here will be to limit his losses by finishing high up in the bunch sprint as possible. Peter Sagan will be targeting those stages will a decent climb where his Cannondale team can look to shed the pure sprinters, including Cavendish. Stages 2 and 3 in Corsica are prime opportunities for him and he will undoubtedly be the favourite to win these stages. The critical stages are likely to be those with a small climb. Whether Cannondale can drop Cavendish on these will almost certainly determine which of the two will win the green jersey. These are likely to be Stages 5, 7 and 14. Cavendish showed in Milan-San Remo that he has worked hard on his climbing and it will be more difficult than before to shed him, but this is where it will be decided. Both riders are in good form this season. Cavendish has 13 stage wins to his name, including a very impressive 5 out of 5 in the flat stages of the Giro d’Italia. Meanwhile, Peter Sagan also has 13 stage wins this season, but in more of a variety of stages. While these two are clearly the two standout leaders in the market, there are other names that could have an impact. The likes of Andre Greipel, Aleksandr Kristoff, Marcel Kittel, John Degenkolb, Nacer Bouhanni and Matt Goss will all certainly be involved in the bunch sprints, but more importantly, they all have the ability to take points away from both Sagan and Cavendish. Peter Sagan is currently the slight favourite with the bookmakers at a best price of Evens with Stan James, while Cavendish is available at 5/4 with 888Sport. The King of the Mountains jersey is always a tough one to pick. Looking at previous winners over the past 7 or 8 years, we can probably rule out the GC contenders, but we are still looking for talented climbers. 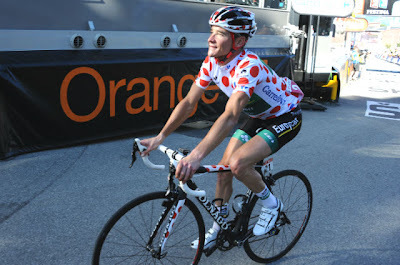 Thomas Voeckler and Samuel Sanchez are the past two winners, while there are several years that are now tainted due to doping-related issues. Particularly with many big points climbs coming fairly early, it is unlikely that the GC contenders will show too much in these, saving their energy for the battles later on. Thomas Voeckler is again the favourite to retain his jersey, while his teammate, Pierre Rolland, is the second favourite in the market. It is difficult to tell what their priority will be in this race – whether Rolland will be having a go at the general classification, whether they will look for stage wins or whether the King of the Mountains jersey could be a real possibility for either of them. Either way, it is difficult to recommend either of them with any conviction. Having discounted the likes of Chris Froome, Alberto Contador and Joaquim Rodriguez, it takes plenty of percentage out of the market, meaning that there is likely to be value in some of the bigger prices. The Euskaltel pair of Mikel Nieve and Igor Anton certainly cannot be discounted. Available at 20/1 and 33/1 respectively, they are both gifted climbers, although are unlikely to be involved in the battle for the leading positions. Frederik Kessiakoff and Johnny Hoogerland are both attacking riders that might fancy a crack, but whether their climbing ability is good enough remains to be seen. The likes of Simon Clarke, Brice Feillu, Daniel Navarro and John Gadret are all names that could potentially be in the mix through a mixture of having a free reign to get into breakaways and climbing ability. Thomas de Gendt is a gifted climber and will certainly look for stage wins in some of the high mountains. Whether he will pick up enough points over the course of the race is in question, but he could pick up big points on some stages. One interesting name in the mix could be Andy Schleck. His climbing ability is certainly not in doubt as he has shown in previous editions of this race, but his form and mental state certainly are in question. As I said in the previous preview, I don’t expect him to be close to challenging for the general classification, so there is a chance that he could be allowed away in breakaways to pick up mountain points. He showed good aggression in the Tour of California and a challenge for the King of the Mountains jersey could gain both him and his team the coverage that they desire. Finally, the young riders jersey should be an intriguing battle. There are a number of talented riders involved, who will also be hoping to challenge for the overall yellow jersey. Tejay van Garderen and Nairo Quintana are the strong favourites here, closely followed by Thibout Pinot and Andrew Talansky. As I mentioned last time, I strongly fancy van Garderen to do well here and so it only seems natural to fancy him for this classification as well.